Residential Boiler Market is set to exceed an annual installation of 10 million units by 2024. Commercial Boiler Industry size is set to surpass a valuation of USD 6 billion by 2024. Industrial Boiler Industry, represented 10% of the overall business space in 2016. Taking into account the massive expansion of the renewable energy sector and the potential application horizon, it is quite overt for the global boiler industry to witness a lucrative growth trend in the coming years. 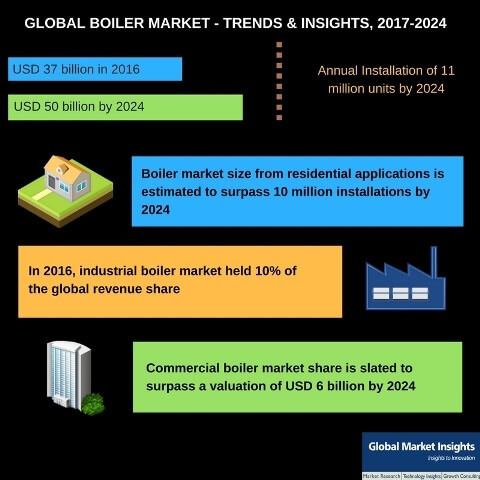 In fact, as per the estimates, global boiler market size, in terms of annual installations, is poised to exceed 11 million units by 2024. The industry is slated to be strongly characterized by the prevailing go-green notion, which emphasizes on construction of green infrastructure and the incessant efforts by the private and government bodies toward drafting policies to meet the sustainability and energy-efficiency criterion. Reportedly, over the recent years, funding and refurbishment of current boilers have been amongst the two most prominent strategies to comply with the energy efficiency demands. In 2016, the Californian state government announced the investment of USD 55 billion in state infrastructure over the next five years. Through this plan, the government plans to implement clean energy norms for promoting energy efficiency projects. The plan also entails the replacement of unproductive high-pressure boilers with efficient hot water boiler systems – a move that may have a sizable effect on the regional boiler industry. The government has also proposed an investment of USD 4 million for the construction of advanced boiler systems at the Deuel Vocational Institution in Tracy. The implementation of supportive initiations such as the aforementioned are certain to have a considerable impact on the regional boiler industry. The UK Energy Research Center has prepared 2050 Target for UK, which aims at 80% carbon emission reduction by the end of 2050. The primary intent of this plan is to decarbonize buildings using low-carbon hydrogen and heat pumps. As per statistics, in 2009, domestic buildings accounted for about 47% of overall regional carbon emissions, while non-domestic buildings accounted for around 20%. On these grounds, the UK government has compiled a strategic agenda to promote the usage of biomass and condensing boilers for the heating systems in domestic and non-domestic buildings – a move which might suitably impel residential boiler market. Considering the robustly growing demand for boiler system installations in the UK, in tandem with the numerous initiatives undertaken by the government, it would be prudent to declare that the UK boiler industry is indeed slated to reach great heights. How is the new heat generation technology influencing Germany boiler industry trends? The aforementioned determinants justify the efforts the government has been undertaking with regards to boiler industry expansion. The German administrative bodies have been generously providing monetary support for refurbishment activities and the purchase and construction of energy efficient houses. The escalating initiatives undertaken by the governmental authorities will not only serve to minimize the carbon content in the environment, but also to increase the adoption rate of energy efficient products. By extension, these activities would have a rather proportional impact on Germany boiler market size, which, as per estimates, covered 15% of the Europe revenue share in 2016. Encouraging major companies to implement biomass solutions instead of natural gas network for their thermal requirements. Ireland, it has observed, has had a high rate of district heating system deployment in the last few years, which is a major factor that would drive the regional boiler industry size in the years ahead. It has also been observed that major companies across Ireland have dutifully complied with the Irish Energy Strategy – for example, Astellas Ireland ltd., in a bid to adhere to its commitment toward energy, the company, in 2010, planned to discover oil alternatives for its pharma facility Killorglin, co. Kerry. In the year 2012, the firm received approval for the installation of new 352 m2 functional building comprising biomass boilers of 1.6 MW capacity and an ancillary biomass fuel store. The deployment of a biomass heating system has also helped Astellas acquire major contracts from their international clients, thereby augmenting its position in the regional boiler market. It has been observed that the governmental bodies of other countries including Thailand, Canada, Kazakhstan, and the like have also formulated power development plans of their own, which is deemed to substantially impel the boiler industry share across these regions. The joint venture of Mitsubishi Heavy Industries, Ltd. (MHI) and Hitachi, Ltd. (HITACHI) - Mitsubishi Hitachi Power Systems, Ltd. (MHPS), has recently invested a substantial amount in research and development to come up with an advanced technology that would improve the reliability and efficiency of boiler plants. MHPS has constructed a large combustion facility to develop new non-destructive boiler inspection methods and combustion technologies. The purpose of this facility is apparently aimed at advanced combustion technology, which suitably impacts boiler performance. Through this technological advancement, MHPS aims to integrate the combustion technologies of HITACHI and MHI to bring about a change in the growth tactics adopted by boiler industry giants. The year 2016 witnessed Superior Holding, a leading producer of boiler equipment and vertical firetube boilers, acquiring English Boiler & Tube, Inc. The merger of both these giants has enabled consumers to purchase distinct categories of industrial boilers and their accessories from a single platform. Pertaining to the largely available engineering expertise, the company is likely to manufacture high quality products, thereby impelling the product landscape of boiler industry. This instance has indeed validated the significance of strategic acquisitions in boiler market. The competitive hierarchy of global boiler industry is replete with notable moguls such as Cleaver-Brooks Inc., Forbes Marshall, Babcock and Wilcox, Weil-McLain, Hurst Boiler & Welding, Burnham Commercial, Thermax, General Electric, Bharat Heavy Electricals, Cochran company, Parker boiler, and Fulton Boiler Works, Inc. It is noteworthy to mention that these companies, in accordance with the globally changing trends of sustainability and energy efficiency, have been working tirelessly to come up with an innovative, power-saving, energy-efficient, and cost-effective range of products. It has been forecast that with the passage of time, the deployment of boilers would only increase across the industrial, residential, and commercial sectors. Inherently stimulated by a slew of government and corporate initiatives, global boiler industry is indeed slated to chart out a rather lucrative growth path in the forthcoming years. Global Market Insights, Inc. estimates the global boiler market share to surpass a valuation of USD 50 billion by 2024.